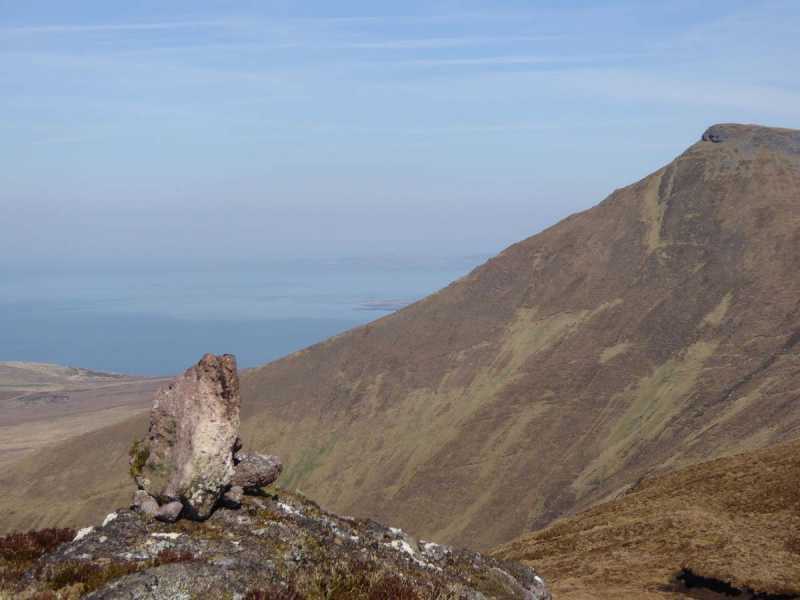 An Seabhac reports hearing from a shanachee that the correct name was Cathair Bhláthnaide, 'Bláthnaid's stone fort'. Bláthnaid was the daughter of the king of the Isle of Man. Cú Chulainn and Cú Roí fell out over who would have her hand. See Caherconree. Previously Ballyarkane Oughter in MV. Caherbla is the 321st highest place in Ireland. I started out on a fine Saturday morning from a small lay-by at Q 716 052 A. I walked up the steep ground at the back of the lay-by heading for Ballyarkane Oughter. The conditions underfoot were quite firm which made for easy progress. At about the 500-meter mark there is a long ridge of conglomerate rocks, which you can skirt around to the south to avoid or pick your way carefully through one of the gaps. Be careful though the gaps are slippery and full of loose stones. 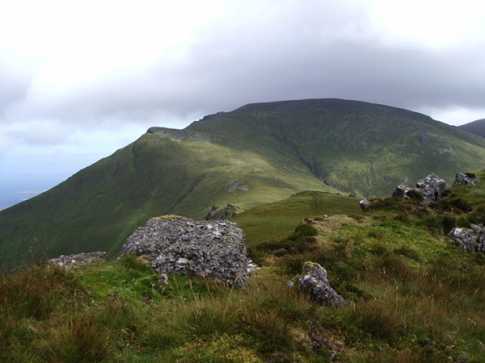 The summit of Ballyarkane Oughter is on a long, jagged, narrow line of rock, which rises about 5 meters above the level of the rest of the terrain. There is no marker, so I took what looked to be the highest part of this line of rock. stop at the Fort ,(built by the King of West Munster Curor Mac Daire in the early Iron age) I climbed on to the summit of Caherconree and managed to find enough shelter from the rising wind at the summit cairn to have my lunch. I moved down the narrow ridge to Gearhane passing over some curious sandstone conglomerate rock formations on the way. 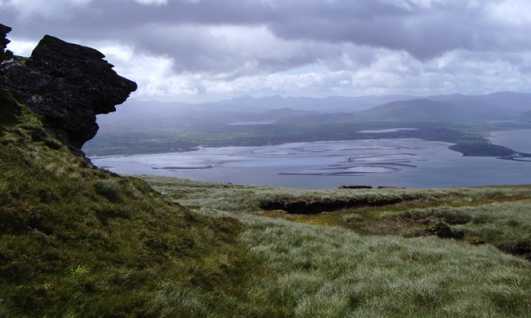 By the time I reached Gearhane the wind was gale force so I beat a hasty retreat and keeping to the west side of the mountain because of the shelter it afforded. The wind on the exposed sections was enough for me to have to crouch during the gusts. I finally made it back to the path to the Fort, which I took back down to the main road. Every time I climb in this area I seem to have to battle the wind at least this time I held on to my glasses! I guess not many would target this curiously-named top on its own, but if you've got an hour or two the north-south road that crosses the range to the west provides a handy leg-up. Steep but dryish ground rises towards harmless crags. 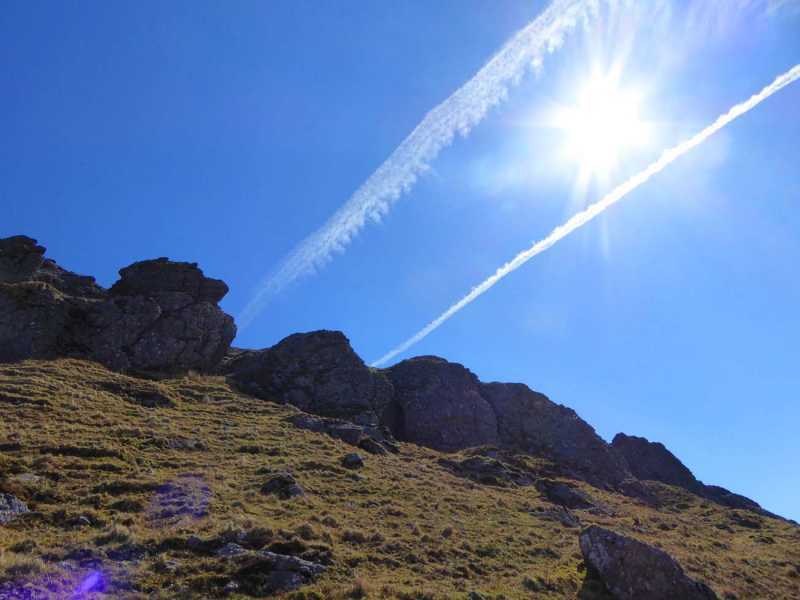 Beyond these a short ascent brings you to an outcropped rise and the unmarked summit. 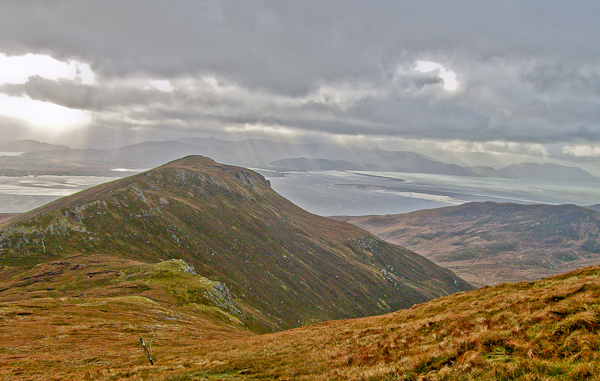 Caherconree looms to the north, but a good views in all directions, with Moanlaur not far westwards.